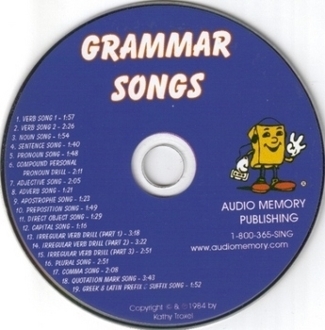 16 songs teach parts of speech, rules of punctuation, usage drills and Greek and Latin prefixes and suffixes. Grades 1 - 10. We highly recommend using the book and Teacher's Guide with this CD. The book has exercises which reinforce what is memorized in the songs. The Teacher's Guide has the answers and extended activities for different grade levels.